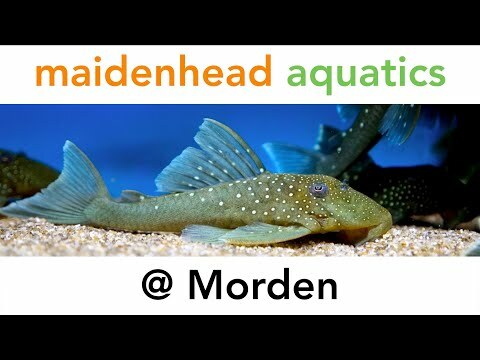 Maidenhead Aquatics at Morden first opened its doors in August 1993 and soon earned a great reputation for its large fish house and huge selection of livestock. This very popular store remained open for 20 years but was unfortunately forced to close in March 2013 when the landlord's lease came to an end. We were delighted to re-open the store in 2015 for the sale of equipment and all dry goods! As well as a huge range of aquariums and associated equipment, it also has a great choice of pond pumps, food, filters, pond plants and liners on offer! The store also has a selection of central South Americans and angel fish, plus beautiful blood-red jewel cichlids, Corydoras (panda and peppered) and some stunning Odessa barbs. Marine species and corals will be coming soon, but please note that the store is not yet fully stocked and will continue to increase the levels and availability of their livestock with regular weekly deliveries. Please call on 0208 646 1066 if you have any queries or to check stock availability, and drop by soon!